Just Listed :: Updated Condo in Smyrna's Country Park! Welcome home! 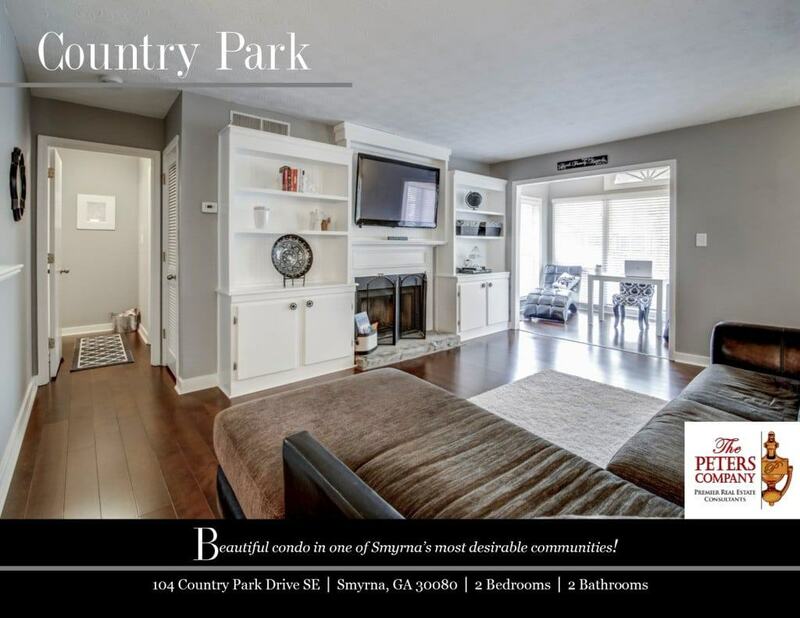 Country Park is a wonderful community in the incredibly popular and fast growing Smyrna area of Cobb County. The open floor plan, custom features, and charming character of this condo will never go out of style. The close proximity to I-285 and I-75 makes it convenient to and from any direction. You’ll also have easy access to the other highways, byways, and activities that make this location such a well-loved destination. You will certainly enjoy being only minutes to Smyrna Market Village, Vinings shopping, several city parks, and SunTrust Field (future home of the Braves). -New hardwood floors and custom wood blinds are carried throughout. -Kitchen features ample cabinet and counter space with a pass-through to the living room. -The spacious living room boasts beautiful built-in bookcases and a cozy gas starter fireplace. -Separate dining area is perfect for entertaining guests or casual meals at home. -A sunroom is light and bright and would be ideal as a home office. -The master suite features dual walk-in closets and an updated master bathroom. -Second master bedroom creates a perfect roommate floor plan and has a large walk-in closet and attached bathroom. -Laundry conveniently located in the unit. -The deck provides great outdoor space. -Wonderful community amenities include a well-maintained pool and tennis courts. -Great location convenient to interstates, shopping, and restaurants. ← Just Listed :: Gorgeous Traditional in Mableton's Liberty Woods!